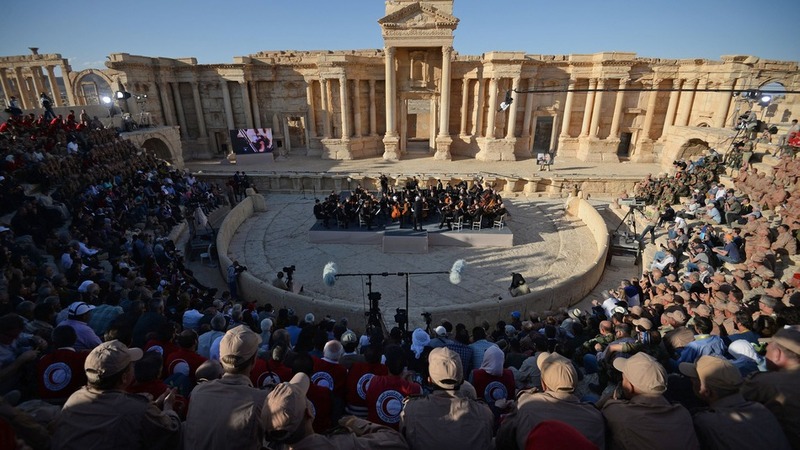 The ancient city of Palmyra has been the stage for mass executions, the destruction of cultural heritage, battles between ISIS and Syrian government forces, and now in an absurd turn of events, a concert put on by Russia’s Mariinsky Theater Orchestra. This strange episode is a stark turnaround after the tragic fate that many ancient sites have met since 2014 in Syria and Iraq. The recapturing of the city and its ruins by Russian and Syrian troops has provided the Assad regime with fodder for soft power against the allure of ISIS. Palmyra, like many other cities in the region, is a fascinating mix of Greco-Roman and Persian cultures. Rediscovered in the 17th and 18th centuries, Palmyra was home to well preserved ruins of a colonnade spanning 1,100 meters, The Temple of Ba’al (a Mesopotamian deity), Diocletian’s Camp, the Agora, Theatre, as well as an aqueduct and necropolis outside the city walls. 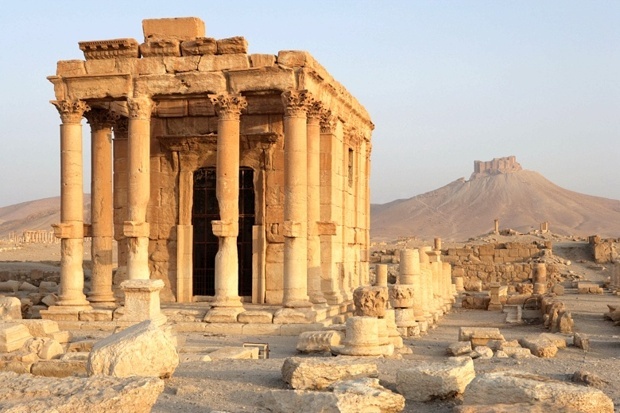 Deemed a UNESCO World Heritage Site in 1980, Palmyra and the surrounding city, home to an estimated 70,000 civilians, was seized by ISIS in May 2015. About three months after the capture of the city, the Islamic State released footage of the destruction of The Temple of Ba’al. Deemed a war crime by UNESCO, it was not the first significant historical site to be destroyed or defaced by ISIS. The group stated goal is to replicate the Islam that was practiced by Muhammad and his contemporaries: a doctrine otherwise known as Salafism. Because Muhammad destroyed the idols inside the Kaaba, the destruction of idols and the importance of monotheistic worship was, and continues, to be an important aspect of Salafi Islam. When ISIS conquered Mosul in June 2014, they released a video showing destruction inside the Mosul Museum, home to artifacts that are up to 3,000 years old. Wielding a sledgehammer against historical artifacts, one man speaks into the camera saying, “The Prophet Muhammad commanded us to shatter and destroy statues […] This is what his companions did later on, when they conquered lands.” In 2001, the Taliban destroyed two giant Buddha statues in Afghanistan, offering a similar reasoning. Since the capture of Mosul, over some 20 ancient sites have been destroyed, including churches, libraries, tombs, temples, and other sites considered to be idolatrous. Included in this list is Jonah’s Tomb and UNESCO World Heritage site Hatra. It is sometimes hard to determine what or how much has been destroyed due to lack of information flowing out of areas controlled by ISIS. In the case of Palmyra, it was only after the city was recaptured that UNESCO was able to go in and assess the amount of damage. Although the external justification for the attacks is religious zeal, it is no secret that ISIS has also been seizing artifacts and selling them on the black market. These items have been found to make their way to Europe and as far as London, where they are marketed as being from Jordan or Lebanon. While looting has been a continuous problem—pre-dating the Syrian Civil War—it has become systematical under ISIS as it is a major source of cash revenue for the organization. Before the jihadists seized the city, esteemed archaeologist Khaled al-Asaad helped assist in evacuating hundreds of artifacts out of Palmyra. When captured, al-Asaad refused to reveal the location of the artifacts and was subsequently murdered. Ultimately, the widespread destruction of ancient sites is an attempt to rewrite history. Many of the sites pre-date Islam and celebrate the region’s old polytheist religions, as it straddled the border between the Roman and Persian empires. By erasing evidence of this pluralistic history, ISIS is attempting to create a different narrative. The destruction of cultural heritage has not gone unnoticed by the regime of Bashar al-Assad. In March of this year, joint Russian-Syrian forces successfully recaptured the city. Assad lauded the victory: “The liberation of the historic city of Tadmur (Palmyra) today is an important achievement and is evidence of the efficacy of the strategy adopted by the Syrian army and its allies in the war on terrorism.” By liberating the city, Assad has effectively equated his regime with the conservation of Syrian heritage sites and ISIS with its destruction. Shortly after the capture of Palmyra last year, ISIS filmed and released a video showing the execution of 25 Syrian government soldiers inside the Palmyra amphitheater. Last week, in the very same location, the tunes of Bach, Shchedrin, and Prokofiev filled the amphitheater. The caculated contrast could not be more clear: while the Islamic State and other factions opposing Assad commit barbarous acts, the Syrian regime offers culture and civilization. The intended audience—Europe and the U.S.—might have failed to receive the message: no representative of any Western countries were present at the concert. And yet as the unsteady ceasefire continues, will Assad actually make an effort to preserve and protect his country’s history or will this Prokofiev-scored stunt be nothing more than an attempt at leveraging soft power to bolster his regime’s legitimacy?